Until now we have been concerned with conventional fire alarm systems. These systems require specialized wiring practices using “in and out” connections to devices in order to maintain supervision of the devices. “T” tapping is another practice also not permitted in conventional systems. the device. These systems have been nicknamed “smart” or “intelligent” systems. Addressable systems are obviously much more complex than conventional systems, but they have an infinitely greater flexibility. Oddly enough, even though they may be exceedingly complex, describing them is a relatively simple matter. The initiating devices and notification appliances are either connected to or incorporate a transponder that has a specific address assigned to it. These transponders are connected to a circuit of the central processing unit which interrogates each transponder in sequence. When interrogated, a device may respond that it is normal, or if an initiating device, that it is in an alarm condition. If a device is inoperative, disconnected, damaged, etc., it will not respond. The central processor then creates a trouble condition and a “device missing” message will be displayed. Present standards require a maximum of five (5) seconds for a CPU to report an alarm from a device. The speed of interrogation has increased dramatically in recent years with the development of better and faster microprocessors. Now there exists a signaling protocol for certain models of smoke sensors where the CPU interrogates a large cluster of sensors instead of individually. This cluster will instantly report an alarm condition when interrogated and then indicate the address of the specific device in alarm. This saves a significant amount of time that would be otherwise required to interrogate each device individually. Line Circuit (SLC). Depending on the manufacturer and design, the circuit can be wired in various methods in regard to fail-safe operation. I recommend consulting the charts of the current edition of NFPA 72 for further information. The SLC does not resemble conventional initiating circuits since it is a data gathering circuit, while conventional devices, having normally open alarm contacts, place a short circuit across their initiating device circuit. A short on an SLC will cause a trouble condition instead of alarm. Connected to this SLC are addressable smoke or heat sensors, monitor modules, output modules and/or data gathering panels. Different manufacturers all have their own various designations for these modules, but generically, they are usually referred to as transponders and in common conversation as modules. The sensors and modules all may be intermingled on the SLC regardless of their (input or control) function. The picture at the top of this page shows this. As stated above, they have their own unique address that is assigned when the system is programmed. This address is assigned to the transponder at installation via a DIP or rotary switch. detector has only two conditions: Alarm or Normal, the newest sensors can notify the CPU that they “smell smoke”, or are approaching an alarm condition, or signal that they are dirty and require cleaning, etc. Their sensitivity can be varied by the control panel and new features are being announced continually. Systems employing these sensors are known as “Analog Addressable” since their condition is displayed in an analog fashion rather than a digital “normal” or “alarm” condition. Many people erroneously use the term “Analog Addressable” to describe all devices connected to an SLC, but technically this term does not apply to devices such as manual pull stations or electronic addressable heat detec- tors that have been employed in these systems until now. Even though heat sensors may be addressable and signal an alarm via the SLC, they can only report the two states, alarm or normal. Now appearing on the horizon are heat sensors that can indicate their changing condition in the same manner as a smoke sensor, such as reporting an increase in ambient heat, so nothing is etched in concrete regarding the ability and features of these sensors. Monitor modules have their own as- signed addresses and commonly feature a conventional initiating circuit complete with an end of line resistor. Conventional dry contact initiating devices are connected to this circuit. These may be electromechanical heat detectors, manual pull stations, water- flow switches, etc. When any of these devices go into alarm, the monitor mod- ule provides a collective address for the devices on its circuit. Newer modules are now available featuring multiple initiating circuits and provide different addresses for each of these circuits. Some modules are small enough to fit inside a device housing or backbox. These modules are usually intended for connection to a single initiating device. An example of this would be a module installed inside a pull station, providing an address for the station. Some manufacturers preassemble the monitor modules into pull stations, etc. while others prefer to sell the module only, and allow the installer to connect the modules in the field. Other monitor modules have an initiating 2-wire circuit that may be extended considerably, and can accommodate a specified number of conventional 2- wire compatible conventional smoke detectors in addition to a number of dry contact initiating devices. This module provides one address for each circuit, and is useful in large areas, such as auditoriums, atriums or gymnasiums where only a collective address is needed to guide fire-fighting forces to the source of the fire. Data gathering panels have been used since the earliest days of addressable systems. These panels resemble a small conventional fire alarm control panel and contain a number of conventional initiating circuits, battery standby, etc. These panels in effect provide a subsystem with its own address, but I wouldn’t be surprised if some of the latest ones provide multiple addresses, one for each initiating circuit. Output or control modules may also be installed anywhere on the SLC. These modules likewise have their own unique address and may be programmed to perform a function in the event of an alarm or trouble on any individual or combination of monitor modules or sensors. These control modules may contain dry contacts that transfer on command, but again, new configurations are arriving on the mar- ket on a daily basis. 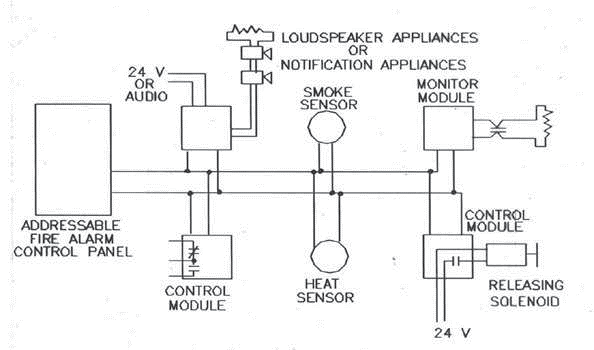 Some will accept an audio input and provide supervised loudspeaker appliance circuits, while others will supervise and operate notification appliance circuits. Still others can be used to energize releasing solenoids or provide smoke damper operation in smoke control systems. System programming also varies with the manufacturer. In the earlier days some small system manufacturers used burn-in chips, or PROMS for the programming. Larger systems are programmed via software. In these sys- tems, the programming is often done in the office on a computer and then down- loaded to the control panel in the field via lap-top computer. Some software programs are user friendly while others are not, and usually require specialized training. The easiest ones to use contain drop-down menus and the programmer need only to literally “fill in the blanks” in order to complete the program. When the system is programmed, a description of the device can also be included (in systems with alpha-numeric display) such as “ionization sensor, main lobby, right wing”. Thus, when the device goes into alarm, this message will display on the readout, giving firefighters explicit information as to the location of the fire. The microprocessor in the main control interrogates or polls the transponders in sequence, with only nanoseconds being required for each device or cluster of sensors. When a transponder is polled, it responds that it is either in a normal state or in alarm. In Analog Address- able Systems, a transponder installed in a smoke sensor will also indicate the condition of the sensor, such as “dirty”, approaching alarm condition, etc. If the transponder is disconnected for any reason (malfunction or break in the wir- ing) the panel will show a system trouble and show a “device missing” message (or code) on the display, which will give a specific location of the device. Other fault messages can be for an SLC break, circuit shorted, etc. Some systems may indicate a circuit break by displaying a list of missing addresses located beyond the break or short. One disadvantage of the addressable system is that polling or interrogation consumes a fraction of a second per device polled. 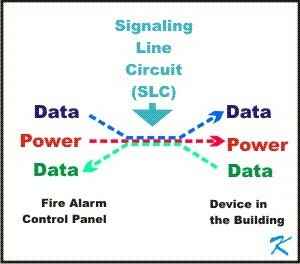 If a substantial number of devices are installed in an individual signaling line circuit, a considerable amount of time could elapse until an alarm is processed. Present control panel standards require a maximum of 5 seconds for a panel to process an alarm after it is received from an initiating device. The development of sensors that will operate in a cluster mode has made this an easier matter. However, it is common to use a larger number of SLCs with fewer devices installed on them rather than have one huge SLC with numerous devices. The addressable system is also programmed to make specific responses depending on the device activated. Thus the system can process an alarm from a sensor with complete alarm response including notification of the fire department and operation of elevator capture devices, operation of smoke dampers, etc. It may also process a supervisory signal from a tamper switch with sounding of dedicated appliances only, or indicate that a control module has been activated and has performed its required function.